Tick-tock. Tick-tock. It was early December and then... in the blink of an eye... it was no longer. Both Claus and Cupid have come and gone, and with them a whirlwind of activity... much of the reason why time has stood so still in this little space. The other is the simple fact that I've gathered much of what I need to complete the project for which this space was created and my attention has waned. Blogging is a business for many... adeptly and creatively accomplished by a large number of folks. For me, it's simply been a great deal of fun. And now, with the objective of my efforts coming to fruition, my visits have definitely ebbed. For now, however, it seems only obvious that one needs to share when that which is cheesey, creamy, flavorful, healthy, easy, satisfying, and comforting... is found. And so... I offer up these enchiladas. They happen to be my new favorite (enchilada, that is). And... they include my new favorite crush food... kale -- the perfect "super" food in every sense of the word. Not only is it great for you, it works well in so many dishes. 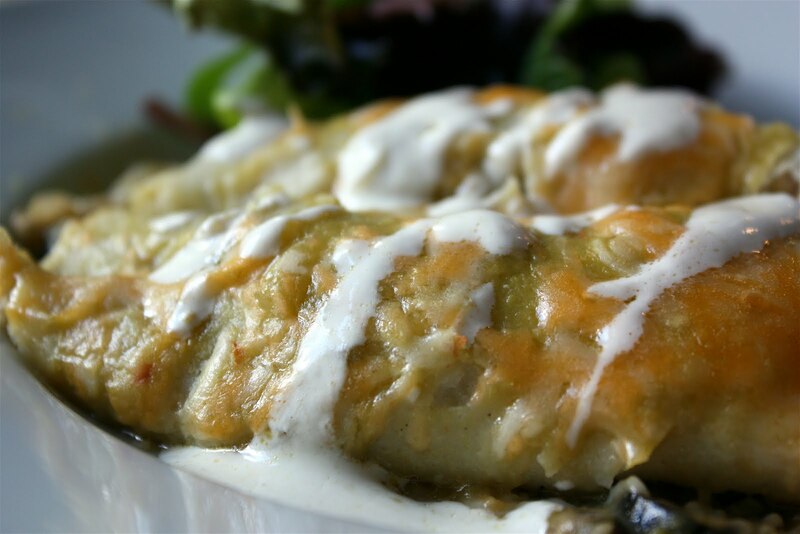 The inspiration for these enchiladas was a rice and veggie dish we had several months ago at one of our favorite brew pubs. The doggie bag leftovers from that night went into enchiladas the next night... and a new dish was born. The great thing about this little concoction is that you can go in any number of different directions and it would be just as good. Roasted mixed veggies instead of roasted butternut squash. Delicata squash if you want it a bit sweeter. Quinoa instead of brown rice. Kidney beans instead of black. You get the drift. And, like so many dishes I like to make, this one has great morphing capabilities. The filling is so good on its very own... a la brewpub variety... for a great vegan option. And, I'm thinking it could even be processed with a few other binding ingredients for a great veggie burger. So... enjoy. Don't let too much time tick... tick... tick... by before giving these a try. 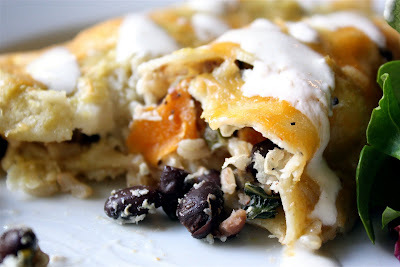 Going with the way I typically cook, I'm offering approximations for some of the ingredients in these enchiladas, allowing you to go heavier on the items you like the best... to craft the flavor that most appeals to you. 2. 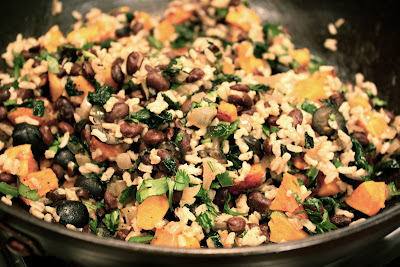 Add roasted squash and cooked rice to kale mixture; return to medium high heat. Drizzle juice from half of fresh lime. Continue to cook until heated through. Season with salt and pepper to taste. Set aside. 3. In a small bowl, mix yogurt, cumin, juice from remaining half of lime, and salt and pepper, to taste. Set aside. 4. Spoon approximately 1/3 to 1/4 cup of rice/bean mixture into each of the eight corn tortillas (warm tortillas in microwave, or over stovetop flame to soften). 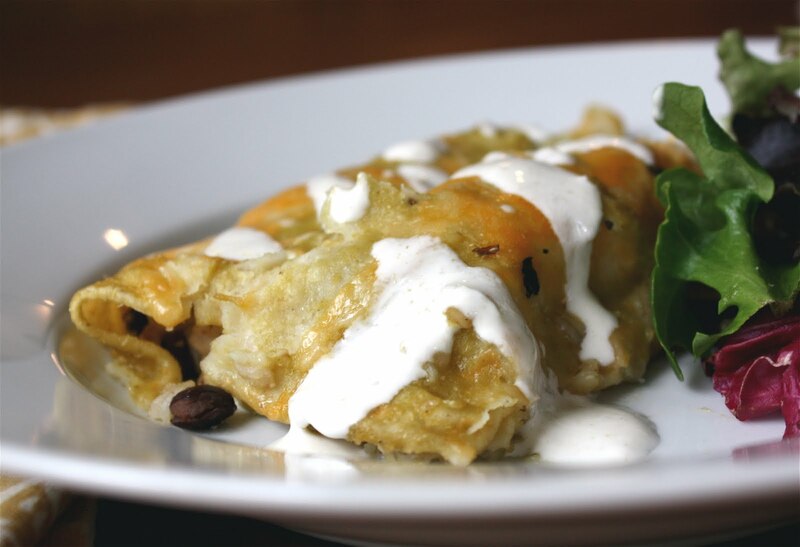 Drizzle approximately one teaspoon of crema atop each portioned filling and roll up each tortilla. Place filled and rolled tortillas, seam-side down, in a large baking dish. Pour enchilada sauce over rolled tortillas. Sprinkle with cheese and place in a 350 degrees F. oven for approximately 45 minutes, until bubbly and slightly golden. Serve immediately with a drizzle of crema over top.